29 September 1904: born in Tôkyô in the district of Tsukiji. April 1910: first stage appearance, at the Imperial Theater in Tôkyô, where he received the name of Bandô Kozuru and played the role of Kantarô in the drama "Shinjû Ten no Amijima". June 1919: Bandô Kozuru took the name of Bandô Takesaburô IV at the Imperial Theater, performing in the drama "Ichi-no-Tani Futaba Gunki". Beginning of the 1920s: he joined the troupe led by Onoe Kikugorô VI. May 1924: Takesaburô became nadai and celebrated the event at the Ichimuraza, playing the role of Kokingo in the drama "Yoshitsune Senbon Zakura". He also played a minor role in the dance "Musume Dôjôji", which starred his master Onoe Kikugorô VI. October 1935: Bandô Takesaburô IV took the name of Onoe Kikujirô IV at the Kabukiza, playing the role of the wakaonnagata in the dance "Mitsu Ningyô". May 1938: Kikujirô played at the Kabukiza the role of Tonami in "Terakoya"; his stage partners were Onoe Kikugorô VI (Genzô), Nakamura Kichiemon I (Matsuômaru) and Sawamura Tosshô IV (Chiyo). 1940s: Kikujirô joined the troupe led by Ichikawa Ennosuke II. 10 July 1949: his master Onoe Kikugorô VI died. 1949: Kikujirô joined the Ôsaka Shôchiku Company and settled in Kyôto. 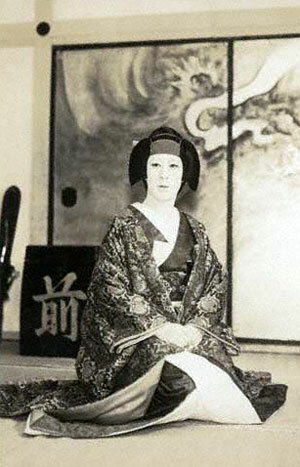 March 1958: Kikujirô took part in the final Kabuki performance at the Ôsaka Kabukiza [more details]. 17 October 1960: his younger brother Nakamura Tomijûrô IV died. March 1976: Kikujirô played for the last time the role of Mimyô in the drama "Moritsuna Jin'ya, which was staged at the Kabukiza. April 1976: the National Theatre produced the revival in 5 acts and 9 scenes of Namiki Gohei I's drama "Kinmon Gosan no Kiri"; Kikujirô played the role of Osai [casting]. May 1978: Kikujirô plays for the last time the role of Soga no Mankô in the drama "Sukeroku", which was staged at the Minamiza; the role of Sukeroku was played by Ichikawa Ennosuke III. January 1981: Kikujirô appeared on stage for the last time, at the Nakaza, where he played the role of Kawachiya Oshô in the drama "Kawashô"; his stage partners were Nakamura Senjaku II (Kamiya Jihê), Kataoka Hidetarô II (Kinokuniya Koharu) and Kataoka Nizaemon XIII (Magoemon). 24 July 1981: Kikujirô died. Onoe Kikujirô IV was a major supporting onnagata actor of the Kamigata Kabuki from the 1950s to the end of the 1970s. His most notable roles were Mimyô ("Moritsuna Jin'ya"), Tonami ("Terakoya"), Soga no Mankô ("Sukeroku") and Oen ("Fûin Giri"). He was also very good in some male roles like Minamoto no Yoshitsune in "Yoshitsune Senbon Zakura".